Working conditions in Finland are generally outlined in the contract of employment when you start your job. Conditions, hours and holidays are determined by TES (työehtosopimus). The working culture in Finland can is punctual, equal and relaxed . Usually, employers are rather flexible what comes to working hours and holidays and there is a relatively low level of hierarchy amongst workers. Always look after your worker's rights. Sometimes employers do not pay salaries and bonuses correctly. This is when trade unions become handy. Trade unions are extremely important to working life in Finland. They regulate and supervise working conditions as well as salaries. Trade unions also offer legal help if an employee is facing unsolvable disagreements with their employer. It is highly advisable to join the union of your field or profession. They also organize private unemployment benefit funds (työttömyyskassa), that allow you to get compensation if you are unemployed. Trade unions and employer unions create general conditions and salary contract for every field of business in Finland. These contracts determine the minimum salaries per profession, working hours, minimum conditions (ie. 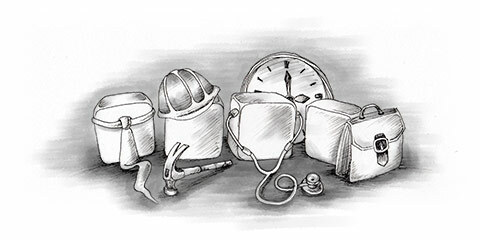 breaks when working in challenging conditions, requirements for uniforms) and compensation for unsocial working hours. You should always check the TES made for your profession as employers are not allowed to make contracts that are weaker than the general one created by the TES. Regular working hours are usually 8 hours a day and 40 hours a week. It is possible to make an agreement with your employer to vary the number of hours you work per week, as long as your average working hours over the course of the month do not exceed 40hrs per week. Some workplaces use a system called “työaikapankki” (working hours bank) meaning that the company calculates the average of hours worked during the agreed time (80hrs / 2 weeks or 120hrs / 3 weeks). Your workplace must provide a schedule showing everyone’s working hours and breaks. In addition, all employees should keep their own record of how many hours they have worked and whether they have been paid correctly. Finland does not have a minimum wage for the entire country. Instead, each industry has their minimum salaries that you can check at the relevant TES. If you already have some working history, TES also gives an idea of how much you should be paid based on your skills, qualifications, experience, and where the company is located. Companies in Helsinki will offer more generous salaries than companies away from the city. If your profession requires you to work unusual hours or in challenging locations, the employer has to pay you extra. If you work on Sundays or public holidays you will get double pay for those days. Workers in Finland are entitled to sick pay once they have worked for a company for longer than one month. Most employers require a doctor’s certificate. Sick pay during the first month of employment is usually 50% of the worker’s salary. According to Finnish law, workers can earn up to 9 days’ worth of sick pay, though this can be altered by TES. If an employee uses up their sick pay allowance from their employers, they will receive around 70% of their salary from the Social Insurance Institution of Finland (KELA ). It is the employer’s responsibility to set up an occupational health service for their employees. Workers earn their holiday entitlement by working a ‘holiday credit year’ starting on 1st April and ending on 31st March every year. 2½ days’ worth of holiday allowance is earned for every month an employee works within one holiday credit year. This means any employee who works for the full year will earn 30 days’ worth of paid holiday leave. Workers who have been employed by the company for less than a year earn only 2 days’ worth of paid holiday allowance per month, amounting to 24 days’ allowance per year. Holiday allowance in Finland can also be subject to a collective agreement (TES) based on the laws mentioned above. There are many possibilities for working parents in Finland to take time off to look after small children, with the amount of maternity and parental leave totalling 263 weekdays. Parents receive a daily allowance from KELA throughout the duration of their family leave allowance according to the employee’s income. Once the period of family leave is over, the employee is entitled to return to their own job. If this is not possible they are entitled to take up a similar position elsewhere in accordance with the contract they had in their previous job. If your child is younger than 10 years old and gets ill you are allowed to take a temporary care leave of up to 4 days. Companies in Finland let employees take study leave up to two years if they have been employed in the same company for a total of one year. The employee’s studies do not need to be relevant to the company they are working for in order to be entitled to study leave. The logic behind this law is to encourage the Finnish population to further their studies and broaden their future career options.